Chapel Hill began living into the new Ministry Structure following the presentation at Church Conference on June 21, 2017. 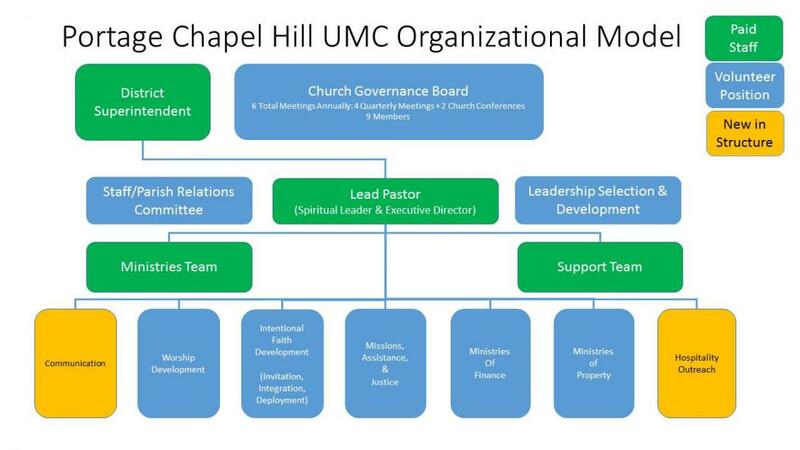 When Chapel Hill accepted the five prescriptions of the Vital Church Initiative, a move to a “policy governance board” model for church ministry was part of the plan. The new structure includes an eight member (plus the Lead Pastor) board that works with the church vision, mission, and core values to implement and maintain a strategic plan. This is a change from our former Leadership Team structure where each core team updated the Leadership Team on their activities. That work will continue between Core Team Leaders and the Lead Pastor. Want more information? Check out pchum.org/PolicyTeam to see an organizational flowchart and details of who is on the new Guidance Board. A new non-representative body of leaders to function in strategic planning and ministry alignment based on mission, vision and core values of Portage Chapel Hill United Methodist Church. The team will be divided into three classes after the first full year of organizing, with the first “class” being 2018/2019. This is the evolution of the VCI Intentional Faith Development Team and the Faithful Community team. This Core Team and will be fully populated by September 1, 2017. This is the evolution of the VCI Worship Development Team and will be populated as the VCI work is completed. This is new team that will center on hospitality as a central value that infuses all aspects of the Chapel Hill faith community. This team will be fully populated by September 1, 2017.